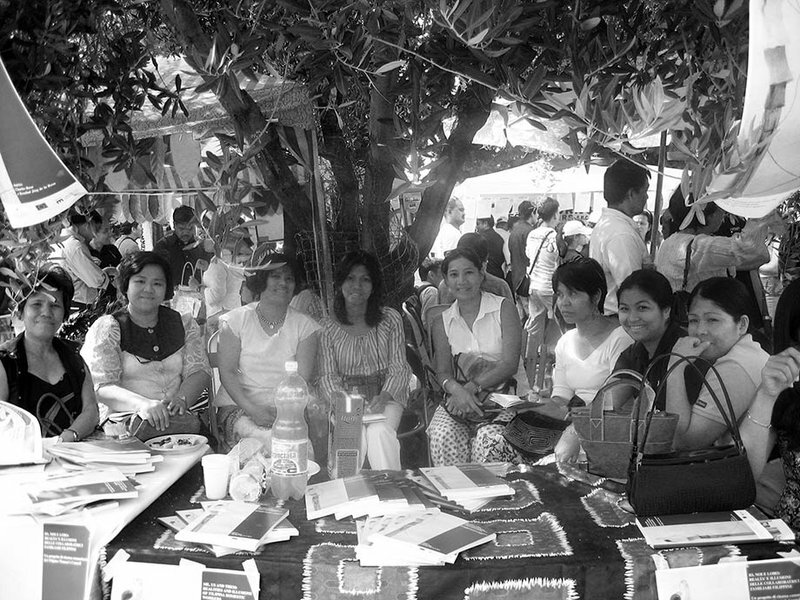 For more than 25 years the Filipino Women’s Council in Italy has worked to improve the lives of their community. Could their path serve as a model? The Filipino Women’s Council displays its latest research. Photo supplied FWC. The Filipino community in Italy is one of the oldest communities of migrants in southern Europe, with first arrivals dating to the 1970s. In 2016 the resident Filipino population in Italy was 167,176, of which 57.4% was female and 42.6% was male. Most Filipino women migrants are employed in the service sector as domestic workers, caregivers for the elderly, and babysitters. By carrying out these roles, they fill the gaps created by inadequate welfare and social services in Italy. Yet their roles go beyond the care industry – as primary and secondary income earners for their families in Italy and in the Philippines; as distant mothers, wives, and daughters; and as members of Filipino communities in Italy and back home. They are women, workers, women of colour, and migrants, and therefore must face problems associated with class, gender, race, and their status as migrants. The first significant collective initiative by migrant Filipino workers in Italy was probably the establishment of the Filipino Women’s Council (FWC) in May 1991. The FWC was founded by 10 Filipino women, the majority of whom were employed as domestic workers in Rome. Our immediate aim was to assist Filipino women by setting up a centre in 1992 to provide shelter and counselling services for victims of violence and exploitation. Our services were also available to migrant women from other countries. The centre closed two years later due to problems with funds and staff training, but it was nevertheless able to respond to the urgent and immediate needs of the people it served. That same year, the FWC helped form the Babaylan, a network of Filipino women’s organisations in Europe, with the aim to strengthen organising work and help empower Filipino domestic workers, wives of Europeans, and students in EU countries. In the 1990s, the FWC participated in a series of international conferences at the United Nations including the UN Conference on Human rights in 1993; the International Conference on Population and Development in Cairo in 1994; the World Summit for Social Development in Copenhagen in 1994; and the Fourth World Conference on Women in Beijing in 1995. We also became a co-coordinator for the Migrant Caucus, for which we produced position papers and recommendations that recognised the gender dimension of in migration, as well as issues related to class, race, and migration status. These position papers are used as lobbying and awareness-raising documents to influence policy makers as they formulate official documents and platforms for action at UN conferences. Migrant organisations are also among our target audiences, as our policy papers may help them better understand how decisions made by our governments at the national level affect migrants directly. After having participated in multiple UN conferences and in parallel with increased awareness around migrant rights – and migrant women rights in particular – the FWC became more visible and active at the negotiation table. We helped craft and lobbied for migrant-friendly policies, including the regularisation of undocumented migrants, the passing of a law providing protection and support to women who are victims of trafficking for prostitution, and easier access to social and health services for migrants. More recently, the FWC published A Guide For Filipinos in Italy to provide Filipino workers with basic tips on how migration policies may affect them, work permits, the process for acquiring citizenship, among other relevant topics. The guide also includes a long list of organisations that provide free services to migrant workers in the three cities in Italy with the biggest presence of Filipino domestic workers. Today, current members of the FWC continue to work in partnership with NGOs and Philippine government institutions in Italy in our advocacy and awareness-raising activities, particularly on awareness-raising projects on violence against women and financial literacy. We collaborate with Italian institutions in our intercultural mediation and translation services. Through our strong network of Italian trade unions, we are able to refer and/or accompany Filipino migrants in their claims for rights, processing legal documents, and various labour-related issues. Despite some advances in the policy arena regarding migrant rights, Filipino domestic workers continue to face important issues that have yet to be addressed. For instance, while family reunification has become easier, reunited partners/husbands often remain unemployed or are limited to employment opportunities in the domestic work sector, despite their education and previous work experience. The children of Filipino couples in Italy are sent back to the Philippines when circumstances do not allow parents to raise their kids with them because of full-time work or housing issues. If they do not do well in school, their parents take them back to Italy in their teen years, and they have trouble or are unable to integrate. Many then end up taking on domestic work as well, therefore precluding aspirations to social mobility for their households. 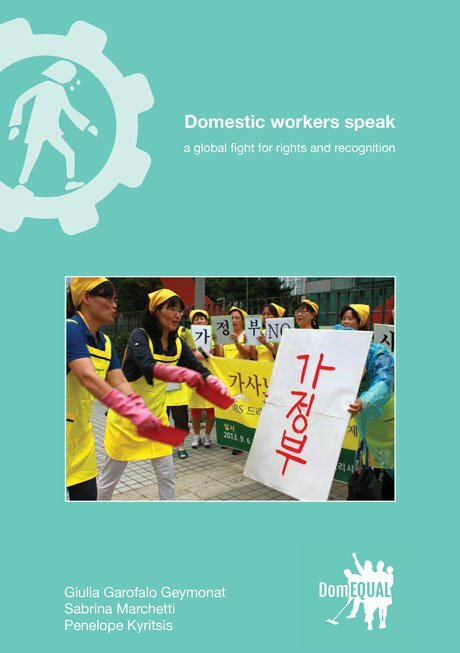 Almost all domestic workers assume the responsibility of helping relatives migrate. Many complicated social and financial issues emerge related to the chain of networks comprising the web of responsibility and care in transnational families. Almost all domestic workers assume the responsibility of helping relatives migrate, legally and illegally, so they could help shoulder the burden of supporting their kin through remittances. Our subsequent study, ‘International Migration and Over-Indebtedness: the case of Filipino workers in Italy’, was supported by the International Institute for Environment and Development in Italy and was published in 2011. To put together this report, the FWC collected testimonies by Filipino migrants on the heavy consequences of the economic crisis and the general impoverishment of the Filipino community in Italy, such as the increasing number of Filipino domestic workers who contract high interest-rate debts with financial institutions and loan sharks. These observations showed that women domestic workers are more likely to go into debt, because they have greater responsibilities in terms of supporting their families in the Philippines and ensuring their own survival in Italy. Getting into such levels of debt condemns domestic workers and their families to a cycle of over-indebtedness, thus making them socially and economically vulnerable. Over-indebtedness is a major issue for many Filipina domestic workers. One strategy proposed by the FWC has been to adopt a frugal lifestyle, save, and invest wisely. To encourage such practices, we launched a transnational project entitled ‘maximizing the gains and minimizing the social cost of overseas migration in the Philippines’, with the participation of the Filipino migrants in Italy and as well as their families in the Philippines. The migrants are able to save and families back home are able to set up small businesses. Another important project was ‘mobilizing migrants’ remittances towards agri-based co-operatives’ that aimed to contribute to agricultural development and to achieve food security in rural areas affected by out-migration. We must not forget to ‘pay ourselves first’ before giving to others. The provision of financial literacy is an ongoing activity implemented by the FWC that focuses on practical issues for migrants: participants work on their actual budget and income and learn to compare expenses in Italy and in the Philippines, so that have a sense of exactly what they are doing with their money in the long term. The project encourages domestic workers to reflect on and learn how to use their hard-earned money properly, and when to say “NO” to the endless requests for support from their families back home. It is about saving and investing and about not forgetting to ‘pay ourselves first’ before giving to others. It is about eliminating dependency by giving opportunities for the families back home to engage in productive economic activities. However, the issue of over-indebtedness cannot be traced solely to migrants’ lifestyle choices and financial literacy. After all, migrant workers in Italy do not receive the average wage accorded to Italian citizens-workers. The value of the Philippine peso, inflation in the homeland, unemployment in the receiving country, and other issues are additional factors affecting the economic stability of migrant families. In light of these issues, Filipino migrant workers have to join forces with other groups, organisations, and movements to advocate for appropriate positions and programs of action for financial sustainability and rights of workers in general. We could say that though first aid knowledge is useful and can even save lives, the FWC must also look beyond first aid. We may have started out as a service to organisation to help women affected by domestic violence, but we have evolved to become a development-oriented organisation that addresses integration and reintegration issues and mobilises workers to achieve sustainable improvements in their lives. Issues related to migration, employment, and the rights of migrant workers have gained significant attention at the global level. This is especially evident when migrants become targets for certain right wing groups, when governments impose more restrictions on migrants and migrant labour, and when calls are made to “send migrants to where they came from”. We need to be informed about these problems, and to link up with global networks that protect the rights of migrants as well as movements that promote the rights of women, people of colour, the working class, and migrants. We have to move from our understanding of what we are – women, women who are workers, women of colour, women migrants – towards where we want to go. Though we have won victories in our demands for the reunification of migrant families, there is still a lot of work to do. Among the bigger challenges are the social costs of family separation prior to reunification. There dynamics of globalisation and migration tend to reinforce imbalances in decision-making regarding who sends money and who makes the decisions back home for transnational families. Will the transnational families in Italy follow the same pattern as Filipino families ‘back home’ as a whole? Will decision-making still lie in the hands of the padre de familia? Will violence against women and children be opposed and eradicated? We also face the problem of developing a FWC that does NOT rely on just a few leaders that are doing most of the hard work. We need a movement in which the spirit of activism and the participation of all or almost all members is alive and continues to grow.